It very recently came to our attention as we were doing some research, that the litter our Cattery was using, Fresh Step, contained crystalline silica. Crystalline silica is used in about all clumping clay litters. Thou the large Litter Industry says the amount of crystalline silica is low, it is still a concern of ours, in addition to the health problems to kittens, cats and humans from the dust that clay litter brings to the air. Our very recent research indicated that crystalline silica could cause cancer. There are numerous articles on the internet about the toxicity of silica to cats and their owners. We have used Fresh Step Cat Litter at our Cattery for years without knowing this. We had used Fresh Step due to it being highly effective in odor control. Our Cattery is now switching over all our adult breeders and our family cats to a kiln dried pine pellet litter, similar to Feline Pine Pellets. Our last litter of kittens transitioned over to the pine pellet litter with no problems. We feel blessed that this information has come to our attention and we can offer a natural kiln dried pine pelleted litter to our kittens and cats that does not cause any harm. Some cats take quickly to it and others will have to be transitioned. It usually depends on their age. When a cat urinates in a pine pellet litter box, the pine pellet turns to sawdust. We are using the pine pelleted litter with the Tidy Cat Breeze Litter Box (Not their pads or mineral litter). We do not use the tray that comes with the Breeze Box. Instead, in order to have more head space for the sawdust, we use a Petmate Large Litter Pan (18.5"x15"x5" UPC Code:0 29695 22183 5) underneath the Breeze Box. We use a full puppy pad in the Petmate Litter Pan. The Breeze Litter box filters the sawdust down to the bottom Petmate Litter Pan for removal about once a week or thereafter. The sawdust can be used as mulch in your gardens and is totally natural. You just remove the dry solids from the top of the box and throw those away. You never need to empty the pine pellets but just add more pellets to ensure that all the slits are covered. Many of our families have the litter box in the bathroom so they easily can throw the solid waste away, via the toilet. We usually put about 1 to 1 1/2" of the pine pellets in the litter box so that the cats and kittens can scratch and cover up like normal. 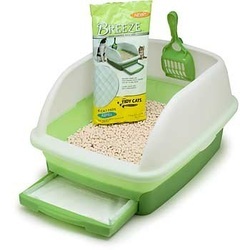 The Breeze litter box comes with a scoop that can be used with pelleted litter. The only complaint on the Breeze box is the small bottom tray, which we have found a better solution to by using the Petsmate Large Litter Pan in place of the bottom tray. If you line the bottom Petmate Litter Pan with a extra large puppy pad as demonstrated in the video, it makes clean up a breeze. Please see the above two videos for more information and how to. If you choose to use pine pellets, please make sure they are kiln dried. We are very happy with this system and it seems to be working very well for us and our adoptive families. By using the pine pellets with the Breeze system, you are actually using very little litter. A 40 lb bag should last a long time. The pine pellets are used by cat breeders throughout the United States. We get our pine pellets from Tractor Supply for $5.99 for a 40 lb bag. The pine pellets are sold as Horse Bedding. Tractor Supply recently started selling their own brand of pine pellets under their name but produced by various vendors. We have contacted Tractor Supply directly to find out which of the vendors are kiln drying their pine pellets. Each bag will have a vendor number on it under the Tractor Supply address on the bag. To date, we have verified that Vendor #518585 does kiln dry their pine pellets for Tractor Supply. So please check your bag to ensure it is from one of the vendors who is kiln drying the pine pellets. If you have any questions regarding the vendor, please contact Tractor Supply directly with the phone number located on the bag. We will continue to update this list as we receive more information on vendors from Tractor Supply. For your consideration, attached are two links to information that our research uncovered. We highly advise that if you are using one of the litters that contain silica, that you consider switching to a natural cat litter like the Kiln Dried Pine Pelleted Litter. If you have any questions about other types of litter, please let us know. We try to protect our babies as best we can when we do find out about an issue. Nathaniel's Mom on Feb. 17, 2013: "He's doing great with his litter box! No problems whatsoever. I really like the breeze litter box and pine pellets system. It sure beats traditional litter boxes and litter. "